Immunogen: Recombinant human LAG-3 (lymphocyte activation gene-3). Source: Purified from the hybridoma culture supernatant by Protein G Fast Flow Column. Specificity: Recognizes the first N-terminal D1 domain of LAG-3. Application Notes: Functional Application: Inhibition. Formulation: Liquid. In PBS containing 10% glycerol. 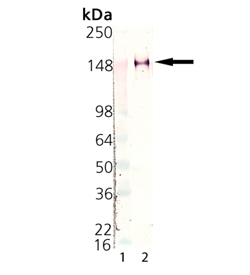 Western blot analysis of LAG-3 mAb (11E3) (Prod. No. ALX-804-805PF): Lane 1: MW marker, Lane 2: LAG-3 (human):Fc (human), (recombinant) (Prod. No. ALX-522-078). SDS-PAGE analysis of ALX-804-805PF: Lane 1: MW Marker, Lane 2 and Lane 3: 2µg of LAG-3 (human) monoclonal antibody (11E3) (preservative free), resolved under reduced and non-reduced condition.